Honda has launched a new top-spec variant of the Dio, which is the Dio Deluxe in India. It is priced at Rs. 53,292 (ex-showroom, Delhi). Honda Motorcycle and Scooter India has launched a new top-spec variant of the Honda Dio, called the Dio Deluxe. It is priced at ₹ 53,292 (ex-showroom, Delhi) and is approximately ₹ 3,000 more expensive than the base variant of the scooter. The Honda Dio Deluxe gets a bunch of new features for the extra money such as LED headlamp and a fully digital instrument console. The new four-in-one ignition key is also now offered on the Dio Deluxe. This is the same unit which is used on the Grazia. Other new features include optional mobile phone charging point in the underseat stowage. There are new colour options too, which are Marshal Metallic Green and Axis Metallic Grey. Also, the rims are done in golden colour, adding to that premium look of the scooter. The Dio Deluxe continues to get the same 109 cc sing-cylinder engine as before, which makes 8 bhp at 7,000 rpm and 8.91 Nm of peak torque at 5,500 rpm. The engine is mated to a continuous variable transmission unit and has a claimed top speed of 83 kmph. 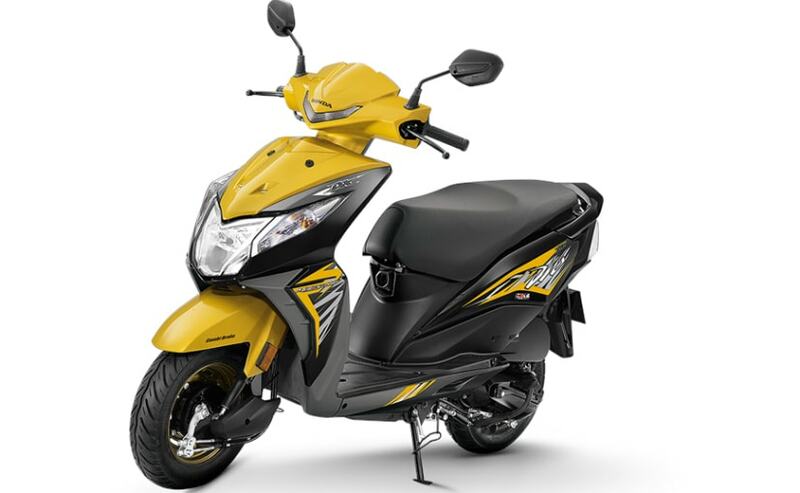 The Dio Deluxe uses 130 mm drum brakes at both ends along with Honda's patented combi-braking system (CBS), which is a standard fitment on the Dio. The Dio goes head to head with the likes of the TVS Wego, Suzuki Lets, the Hero Maestro Edge and the Yamaha Ray ZR. The scooter will be reaching the showrooms this month itself and the deliveries of the scooter will begin towards the end of this month itself.